Jumping forward a few days, we made our way up to Northern Ireland. 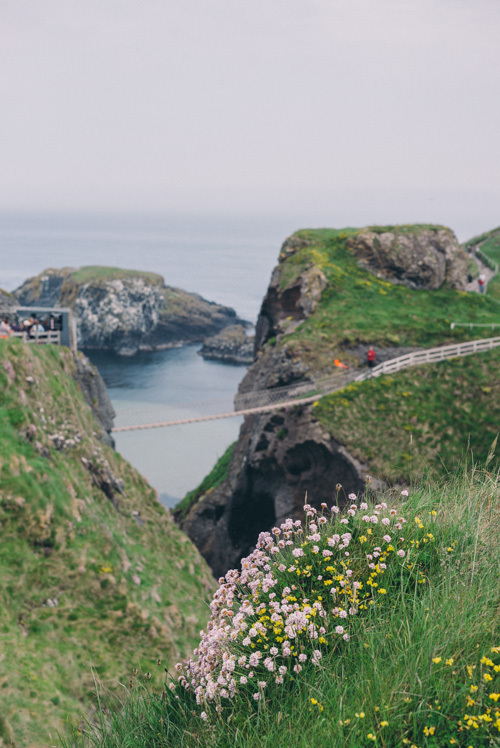 Carrick-a-Rede Rope Bridge is bound to show up as a suggested place to visit when looking for things to do in Northern Ireland. We added it to our list, knowing only of it’s location and beauty. 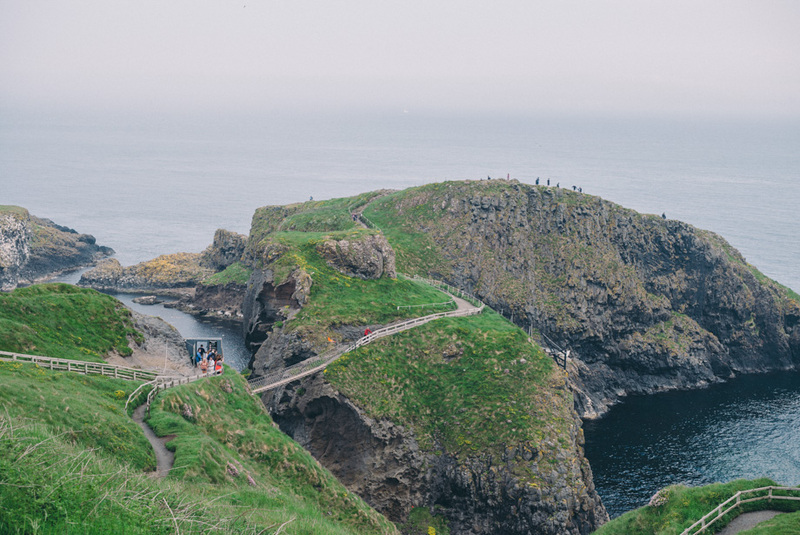 As we started to approach on the walk in, we started to wonder why a random rope bridge would be built out to a little island along the coastline. After reading some material we learned the significance of the island for local fishing purposes. As it turns out Salmon Fisherman constructed the bridge in 1755 so that they could cross over to the island which offered them easy access to water that was filled with salmon. Years of declining rates of fish catching led to the eventual discontinuation of fishing in these waters in 2002. 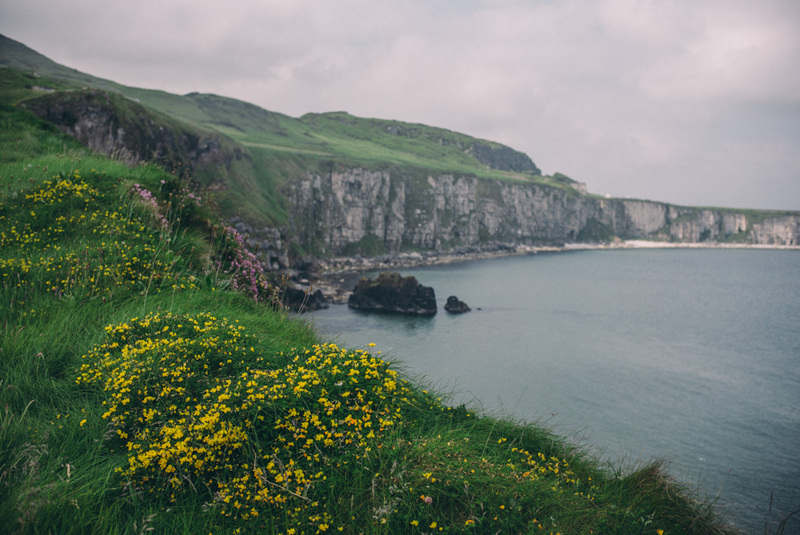 If there’s one thing for certain, Ireland has some of the most gorgeous coastline we’ve come across. 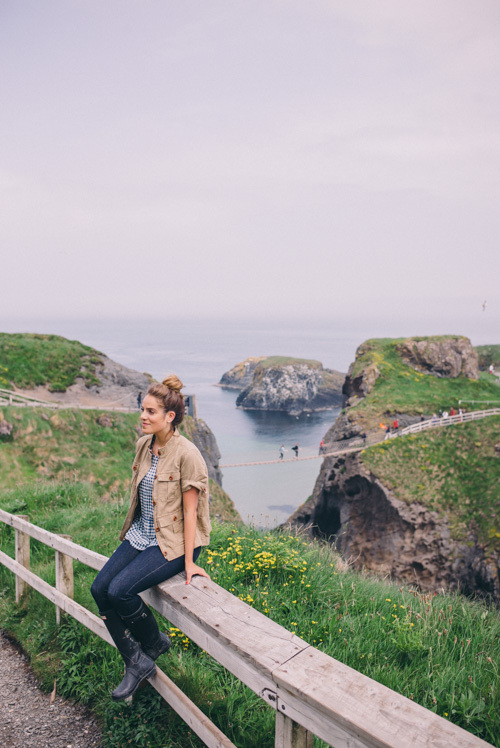 It’s a 1km walk between the closest parking lot and the rope bridge, a beautiful walk along the coast. Eventually, you make your way up a hill and then down to the rope bridge. Of the two of us, Thomas is way more scared of heights than I am. We both crossed with ease. It wasn’t scary crossing the bridge but the only thing that made me a little nervous was when someone else walked on the bridge, the whole thing would bounce. Once safely across we were greeted with even more beautiful views along the coast. If I’m going to recommend any packing tips for Ireland, it would be layers, layers, layers. Every day was different and the climate and weather would change throughout the day depending on where we were. The coastlines were a bit cooler with a crisp breeze while walking through the little towns would get a bit warm. I love this J.Crew Safari Shirt Jacket for summer because it’s the perfect loose layer over a simple tank and jeans or even a cotton dress. I wore it with thisJ.Crew Ruffle-Hem Silk Top In Gingham and jeans paired with my Hunter boots and this J.Crew Surfside Canvas Tote In Stripe, also from J.Crew. A few other pieces that would be great for summer travel layers include this J.Crew yellow anorak or this field jacket, this eyelet ruffle hem top or this seersucker crop top as well as these gingham cotton shorts or this linen midi skirt. After learning from our previous trips to the cliffs, my hair was much better up in a top knot! Thank you to J.Crew for sponsoring this post. I almost bought that top! 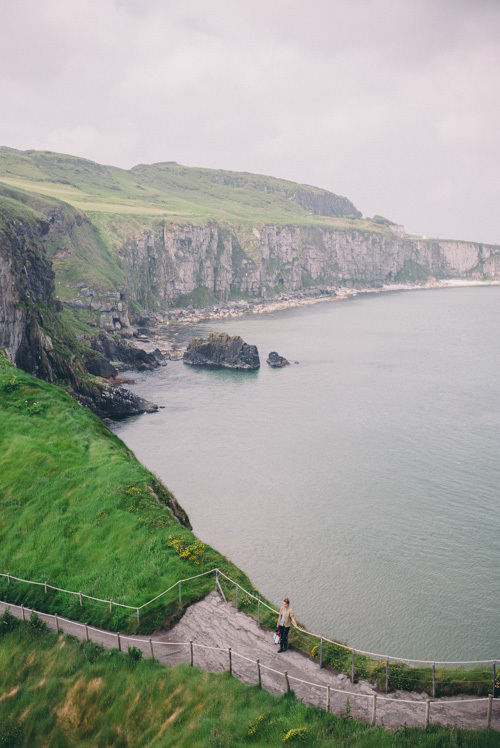 Now I want it even more :) Gorgeous photos, those cliffs are unbelievable! That short sleeved jacket is so cute! I love the look of layering, but it gets too hot for that here in Vegas, so that would be a great item to add to my closet! Gorgeous pictures! 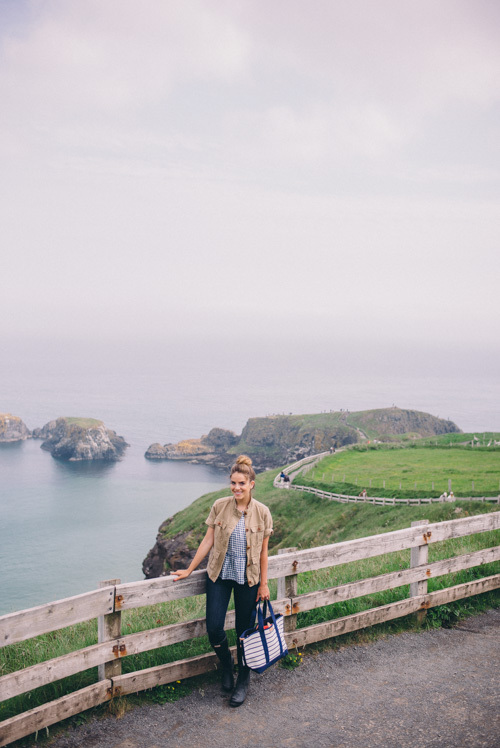 Ireland looks breathtaking! Gorgeous nature never stops inspiring me!! Beautiful photos and your casual and comfy outfit is so cute! That bridge scares me lmao. Also, love the recommendation for layers as well as a top knot for the cliffs. These photos are absolutely stunning! Also loved yesterday’s episode of eight-eyes – especially the bloopers! The short sleeve jacket is a great idea for cold summer days! Love your pics! Looks so beautiful!Great outfit!! You look absolutely beautiful! So glad you had a good trip! These photos came out awesome! The views in this post are just amazing!!! Thanks so much for sharing, Julia. I love keeping up with all your exciting travel adventures. And of course, I love seeing all your cute outfits!! oh my god – these pictures are amazing!!! love the one with the rope bridge! 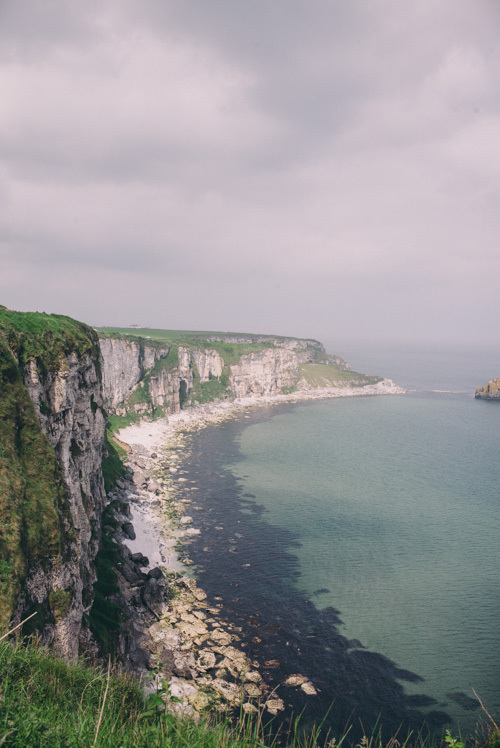 Ireland looks so breath taking! Cant wait to visit myself someday! I can’t wait for this full itinerary. We are planning an ireland trip after our recent trip to Dublin!! What an amazing location! you never fail to disappoint! You are this blog and this blog is you. Ireland is just breathtaking! Loving these pictures so much. Love the touch of that vest! Such a cute look!! Loving the top! Gorgeous photos! The coastline there really is magical! Plus I love your outfit! J. Crew is definitely one of my favourite brands. 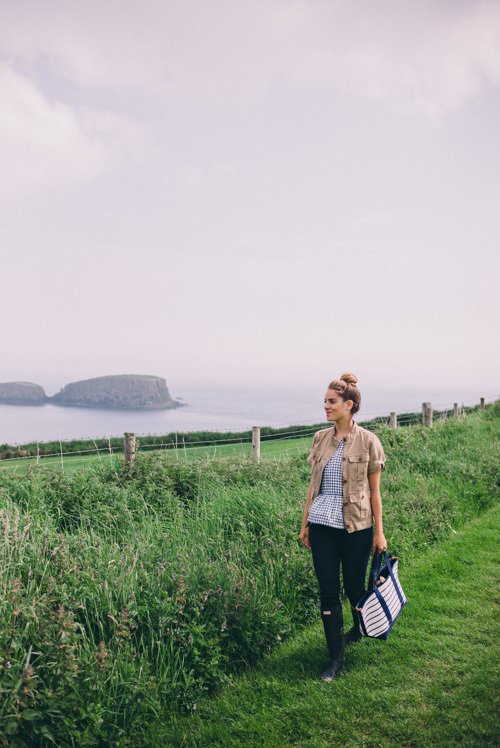 I adore the way they take classic pieces like a safari jacket & gingham top & put a fresh spin on them. Looks amazing! Those views are to die for!! 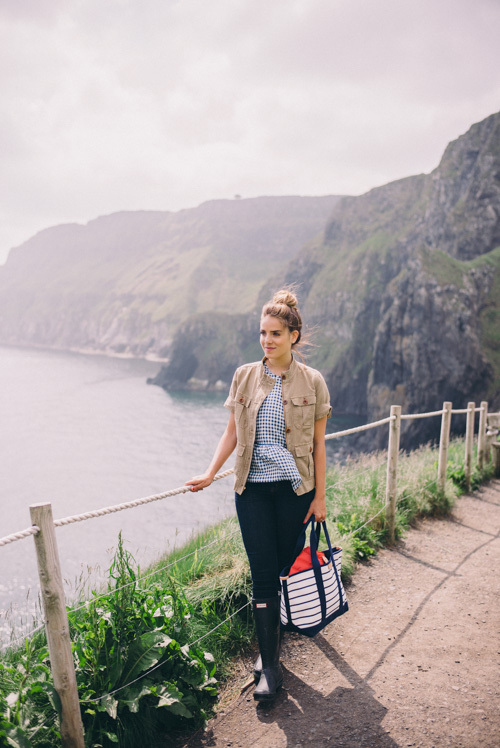 Love your photos of Ireland so much, and that striped bag is perfect for traveling! The scenery is so beautiful there! I would be scared to cross the bridge but it looks so worth it! J.Crew has the best selection right now, too. I want everything!! Gorgeous look! I want to go to Ireland! What gorgeous photos, it looks and sounds absolutely incredible! Ireland looks stunning! I never knew how it actually looked. There is such a neat story behind the bridge. Thanks for sharing! This looks so amazing! Definitely adding it to my bucket list. These are absolutely stunning, Julia!! I’ve always wanted to go to Ireland!! Loving that gingham blouse too! These photos are just phenomenal and that shirt jacket is an amazing find! Gorgeous Julia! So pretty! Love the vibe. You are so adorable! I love all of your travel looks, especially the low-key country looks. These photos are breathtaking!! Ireland is just gorgeous!! Just absolutely gorgeous and breathtaking views Love! love Ireland ado your outfit! Looks so beautiful there! I’d love to visit!